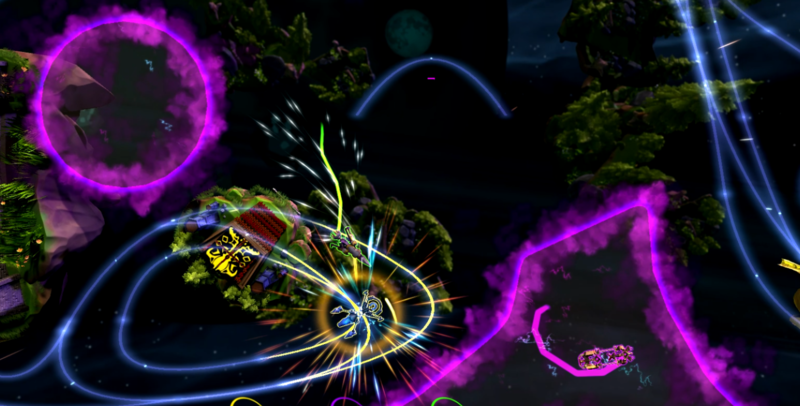 Collidalot is a competitive mix of spaceship sumo wrestling and tony hawk rail grinding. Star ships grind on gravity rails and smash their opposition out of gladiatorial arenas over the cracked remains of their home planet. The world of Collidalot must be released from the grasp of the mysterious Withdrawn. Their gravity rails ensnare your planet and separate whole societies. Steal one of their ships and duel their occult conclave for control, but be careful, who knows how much they are really holding together! Dive into a world of high fantasy run on the principals of magic and knighthood where factions vie for dominance over kingdoms of sutured rock. Use the Withdrawn's visionary star ship designs to take down their empire and assert your faction's dominance of the known universe. Grab some friends and challenge them to quick action packed matches. Pure arcade gameplay invites players of all skill levels to have a blast. Master the ability to grind and jump like no other game. 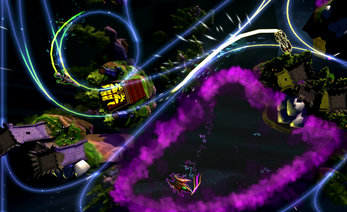 Feel the force of your hits as you send your rivals careening off the map to their doom. Use warp to snipe an enemy off the map or flip shot to instantly reverse your velocity and get the drop on you opponents. Unleash lacerating special abilities that have been tailor designed to make every ship feel unique. Take advantage of an opponent's weakness at just the right moment with The Assembly's Shout or surprise them with a grab from The Umbra's Thorns. Fight your friends for dominance! Choose a faction and take on the universe to prove yourself as rightful heir to the throne, in the Galactic Arena! We will be updating the game over time, please leave any feedback you have! I like the level changes, though I wish there was an option to choose the older tracks. The cloud of death was interesting and I like that there are walls that you can bounce out of. There was a big bug for me at the very beginning where I couldn't even select the options and had to go into the 'Play' option. Mouse controls while selecting ships were funky as well. I don't remember if that was an issue before. I didn't know how to get more charges (I assume through eliminations), which I think the tutorial would have explained it if I had the ability to go there. Other than that, it seems solid so far and I like the graphical changes! I just wish I could choose the old as well as the new tracks. Overall I thought the game was really solid, and really interesting in the fact that I had to use the rails to survive and avoid opponents. I saw the log so I'm going to briefly comment on those things. The AI as is, is fine I believe. Although a way to select difficulty would be nice (which I understood as the improved AI part). I agree with changing the art style. Sometimes it was hard to differentiate what was my ship and what was the background. Individually they looked pretty cool, but it can get hard to see when it gets intense. The mouse and keyboard controls were fine in my opinion. They were responsive and I had no issues with them overall. If anything, I would want to add in a mouse sensitivity or something, since it is kind of hard to accurately snipe when it feels like it is super sensitive. Also I would add something in the controls menu to show what the keys do on the keyboard/mouse configuration, instead of just showing the xbox controller mapping. Now for the things that weren't mentioned in the log. I mentioned this at the start of the let's play, but when you play it in a windowed mode, and even at the beginning when you select the resolution, the top of the window says "Love Letter Prototype." I'm sure this can easily be fixed, but I just wanted to point that out. Another thing that could be improved is the ability to use your ship as a sniper bullet. I love the idea, and using it is fine, however I would like to suggest that the beam color when fully charged match the color of the player. 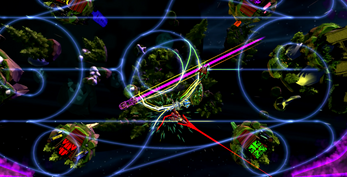 As it is now, every beam has the same color, so when multiple ships are near each other and they all do the warp, things can get confusing (at least to me). I also found it weird that the tutorial map isn't the same map as 'Tutorialopolis.' It's not a bad thing, I just thought that a map with a name like that would be the map for the tutorial. Now for the good! I loved the variety of levels. Will there be an editor in the far future? 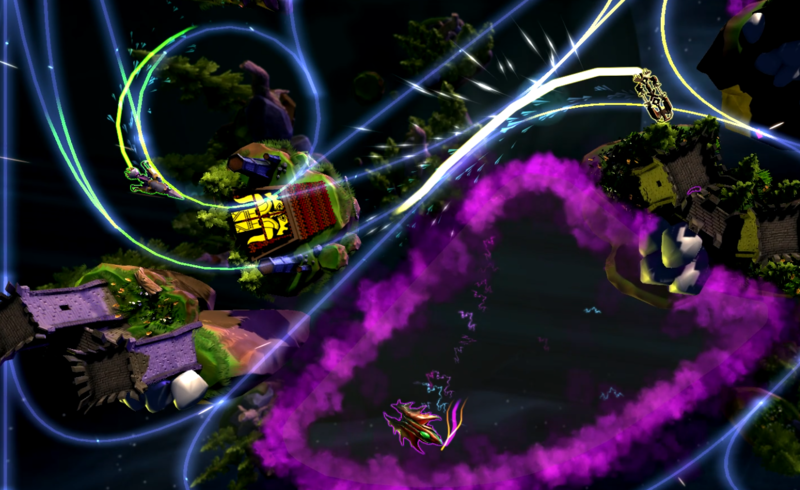 I could see people creating their own levels as well as playing on the bunch that came with the demo. I also liked the music. It fits pretty well I think. I also like the variety of ships, though I wonder if more will be added in as it gets updated. I can see a lot of potential for this.